In bronze with light tan interior. Having covered only 35,000 miles from new, this very rare pre-facelift E12 525 automatic is in beautiful, original condition throughout. It was a Park Lane demonstrator initially and one gentleman owned it from 1979 until 2016. The car is fitted with a three speed automatic gearbox, power steering and a factory steel sunroof. All the original handbooks, service book and Dealer blue wallet. The original dealer-fit coconut mat and Blaupunkt radio with its instruction manual. There is no rust anywhere and the underside is amazing with no road grime or deterioration to the suspension components. As a pre-facelift car, this one has the filler flap by the rear number plate and the fluted bonnet. There is no rust anywhere and there has never been any rust, the car is completely original and never been restored and most of the paintwork is factory. The underside is as new and under the wheel arches are amazing. They look like they have just left the factory in Germany. 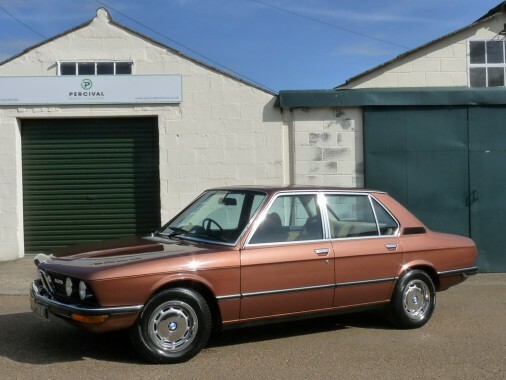 This is probably the most original, unrestored first generation BMW 5 series in the UK! In truly stunning, original condition.